I eat more ice-cream now than I ever did before beginning the Specific Carbohydrate Diet (SCD). Regular ice-cream was just one of those foods that I knew I didn’t tolerate well. 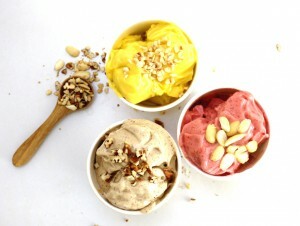 Since starting SCD, I have had the freedom to experiment with so many different “ice-creams” that don’t upset my tummy. I was inspired to write this post about dairy-free, no churn ice-creams to show you how easy it is to make your own delicious and SCD-legal frozen dessert. I call this dairy-free, no-churn ice-cream because to me it tastes just like ice-cream, only minus the dairy and copious amounts of refined sugar. 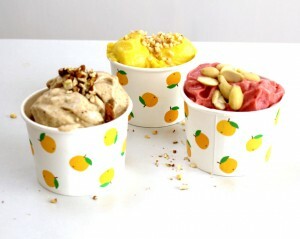 The flavour possibilities are endless but here are three of my favourites: mango, banana and almond butter and strawberry. Honestly, there is no reason for fork out lots of money on expensive dairy-free ice-creams. 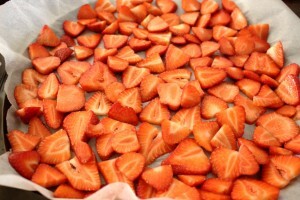 All you need to do is freeze some fruit in advance and you’ve got yourself some amazing dairy-free, no churn ice-cream. I do love making ice-cream the traditional way too. My ice-cream machine is one of my favouite kitchen gadgets. Let’s face it, though. It can be quite time-consuming. This recipe is so fast that you can literally whip it up in minutes. Perfect for a hot summer’s day. My daughter knows no difference between this and regular ice-cream and my mother-in-law who is dairy-free couldn’t believe how good these tasted. I usually let grocery stores offers dictate which flavour ice-cream I’ll make. 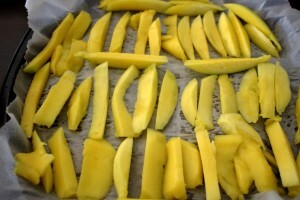 If the mangoes are on sale as they were last week, then we’ll stock up! The banana flavour will always be a firm favourite of mine too as I can tolerate it even during a Crohn’s flare. Ice-cream during a flare up? Now, there is something I never would have believed possible! 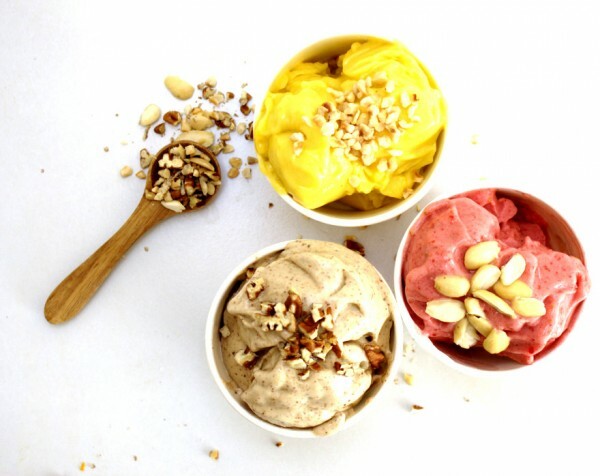 Three delicious flavours of no-churn, dairy-free and HEALTHY ice-cream. Free of refined sugar, Paleo and SCD-friendly. Combine the ingredients for each flavour separately in a blender and process until smooth. Enjoy as a soft serve immediately or freeze for a firmer consistency. Thank you so much for all your awesome recipes! They are really amazing! Tonight we tried your almond ice cream and I just have a question. Do I have to add any liquids to the ingredients. It seems that my frozen bananas get stuck in my blender. Yesterday, I tried adding some coconut milk which helped but today, we didn’t feel like a coconut flavour. Sorry that that happened to your bananas. My blender is super powerful so I never have that problem. All I can suggest is to keep blitzing and scraping down the sides. Of course you can add some coconut milk but I personally prefer it without also. Hope this works out better the next time! I can’t tolerate bananas. Do you know of another substitute? Bananas really make the ice-cream “creamy” so I’m not sure what else would give the same result. Frozen mango works great but is more like a sorbet consistency than ice-cream. You could try blending avocado with another fruit to achieve the creaminess. Let me know if you try it!